Use this data visualization tool to quickly identify important terms in a document. Create a Word cloud in Excel using the XSTAT software. 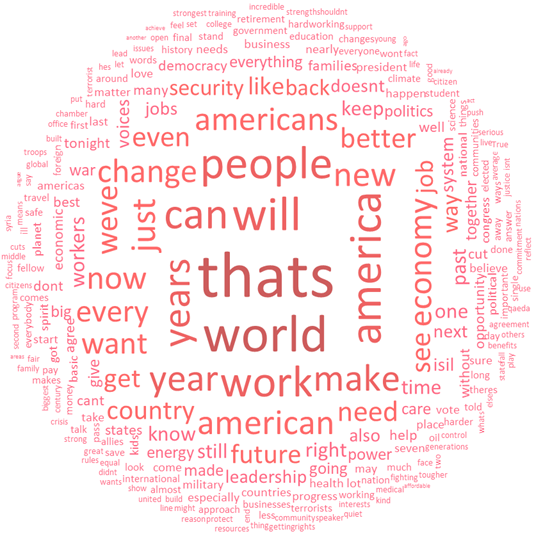 Word cloud is a visualization tool based on frequency. In its simplest form, only one dimension of information is shown: the font size is proportional to the word frequency, which means that the larger a word is in the cloud, the more frequent the word is in the document. The word cloud feature takes as input a vector of terms (term labels) and a term frequency matrix (one column per document). A word cloud is displayed per document in the output. Max. words: Set a maximum number of words to be plotted in the word cloud. Least frequent terms will be dropped. Random position: Plot words in random order or in decreasing frequency from the center of the plot. Rotation period: Set the rotation period of 90 ° between each displayed word. By default, the rotation period is 4 words, i.e. one rotation at 90 degrees will be applied to the cloud display sequence every fourth word. Color scale: You can either randomly assign colors to words or manually select the cells corresponding to the color scale. The output is either one or several Word Cloud charts (according to the number of columns in the Term frequency matrix). The color, the font type as well as the position of the words in the Word cloud can be customized.